In a nutshell Heart Resonance is an energetic system that I grounded onto the planet about 16-17 years ago. It is an continually growing system with activations and information given to me from spirit. It is currently taught in four levels – Level One , Practitioner level, Advanced Practitioner level, Advanced Practitioner Master Class. There is also a Heart Resonance Planetary and Personal Grid activation available as well. Finally there is also Heart Resonance Teachers training available too. As Heart Resonance has grown and expanded through the years, active practitioners have experienced an increase in their ability to handle greater flows of spirit energy. As a result, they naturally become subtler in vibration. This has had a broad ramifications for their lives, such as: a greater level of sensitivity to energy in general; more intuition; and a clearer view of what is spiritually true within their lives and others’. They have become more aware, more realised. When I look back to when I first grounded Heart Resonance onto the planet, and the journey I have been on since then, my perception of why it is here starts to make a lot more sense. Even how my spirit teachers have changed through this time also makes more sense. With each new teacher having been more intense in energy than the previous one/s, they have had a greater impact on my energy. Each spirit teacher has had a transformational impact on my life, stepping me further and further along my awakening. Everything has been geared towards building greater capacity and tolerance to higher spiritual light. The more spirit energy impacting on my body, the more conscious I have become, and this is the case for others who have the Heart Resonance Transmission/s. It has been a gradual and nurtured process of energetic expansion. Heart Resonance’s powerful ability to release deep seated negative emotions and imprints is profound. Also it’s ability to bring a person into a more allowing energetic place and function thereby allowing the person to live in a more conscious way is astounding. I have been trained in many energetic systems throughout the 40 odd years I have been working with energy, and Heart Resonance never ceases to amaze me in its simplicity and how it positively changes people’s lives. I have a sincere desire for many people to access Heart Resonance, the world would be a far better place if that occurred. So I would like to give you a present of my official Heart Resonance book that explains in more detail my journey and how Heart Resonance can benefit you and the planet. If after reading the book you feel drawn to join the global Heart Resonance family of conscious people I urge you to seek out a Heart Resonance teacher near you and do a workshop. 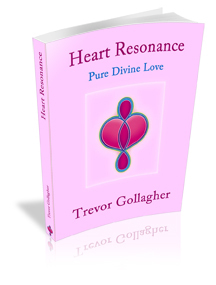 Lots of love and happiness Trevor Gollagher -founder of the Heart Resonance system. This entry was posted in Uncategorized and tagged #ascension, #Divinelove, #HeartResonance, free books, meditation, starseed, trevor gollagher, yoga. Bookmark the permalink.